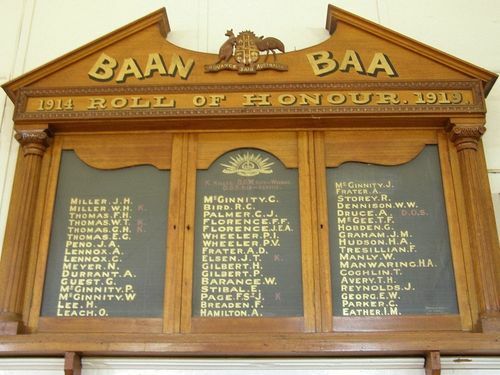 The Baan Baa Roll of Honour commemorates those who served in World War One. Baan Baa was en fete when a roll of honor was unveiled in the local school last Friday. The ceremony was performed by Mr. W. Wearne, M.L.A. The honor board is a beautiful piece of work, executed by a local firm and contains 51 names, several of whom have paid the supreme sacrifice. In the evening a welcome home, taking the form of a banquet was tendered to Lance-Corp. Lennox, who had just returned from this front, having lost a limb. Daily Observer (Tamworth, NSW), 4th May 1918.